Top executives of Infrastructure Leasing & Financial Services (IL&FS), including Ravi Parthasarathy, Hari Sankaran and Arun Kumar Saha, misused Employee Welfare Trust (EWT) and "the trust deed was instituted fraudulently with criminal intention to gain unlawful benefits," reveals the submission before the National Company Law Tribunal (NCLT). The submission also exposes how the EWT was mainly used for enriching few select employees. EWT, with outstanding loans of Rs500 crore, holds a 12% stake in IL&FS. Quoting the interim report of the Serious Fraud Investigation Office (SFIO), the ministry of corporate affairs (MCA) reveals how the trust deed was amended six times, with the last three supplemental indentures without any board approval. "...it is clear that the last three amendments were carried out without any approval of the board of directors of IL&FS, the settlor of the trust. This indicates that the intention of the trustees of EWT, who happened to be the directors of IL&FS and its group companies, was to fraudulently benefit themselves," the report says. According to SFIO, the fifth indenture was made on 17 April 2006 to include that the trustee should have the powers to sell or any portion or part of the trust investments either by public auction or by private contract, indicating that the trustees started acting in a completely arbitrary manner without being accountable. There was an important provision in the fifth supplemental indenture which stated, "The employees of the IL&FS being the beneficiaries under the said indenture of trust as amended from time to time have given their consent to this fifth supplemental indenture." However, SFIO said, no document pertaining to the employees' consent to change the indenture of the trust is available. "This is (a) fraudulent act on the part of the trustees and directors of IL&FS as criminal intent to defraud is apparent. In addition to this, they also had conflict of interest in discharge of their duties as they happened to be beneficiaries of fraudulently amended indenture deed without disclosure to IL&FS," it added. As per the report, the committee of directors (CoD) of IL&FS consisting Ravi Parthasarathy, Hari Sankaran and Arun K Saha approved the indenture. It says, "All these three persons were also the trustees of the EWT at that point of time. There was conflict of interest on part of the CoD and trustees, as the same persons occupied both offices." After the amendment, the EWT was used to invest in securities of IL&FS and group companies with the loans obtained from IL&FS and its group entities. These shares, however, were distributed at a very nominal price to some select management personnel of the group. After selling the investment to a third party, the sale proceeds were distributed among the same selected management personnel at the cost of EWT objectives and IL&FS group, the SFIO pointed out. From 1 April 2011, Vibhav Kapoor, K Ramchand and Ramesh C Bawa were trustees of EWT. By the sixth supplemental indenture on 31 March 2011, the board of trustees at EWT was reconstituted and Vibhav Kapoor, K Ramchand and Ramesh C Bawa were made permanent trustees till 31 March 2016. However, SFIO found out that these three continued to remain on the board of trustees beyond March 2016. They resigned only on October 2018. While Mr Kapoor was the chief investment officer of IL&FS, Ramchand was the managing director (MD) of IL&FS Transportation Network and Bawa was the MD of IL&FS Financial Services. The interim report of SFIO also shows creation of another trust, IL&FS Group Employees Trust (IGET), for which Vibhav Kapoor was settlor and Arun K Saha and Hari Sankaran were beneficiaries. IGET's trustee was IL&FS Trust Co Ltd (currently known as Vistra ITCL Co Ltd). While there are no documents to determine the relationship between IGET and EWT, the SFIO found that IGET aggregated all the shares held by employees and sold it to Life Insurance Corporation of India (LIC) at Rs1,100 per share. The same money was paid to employees. 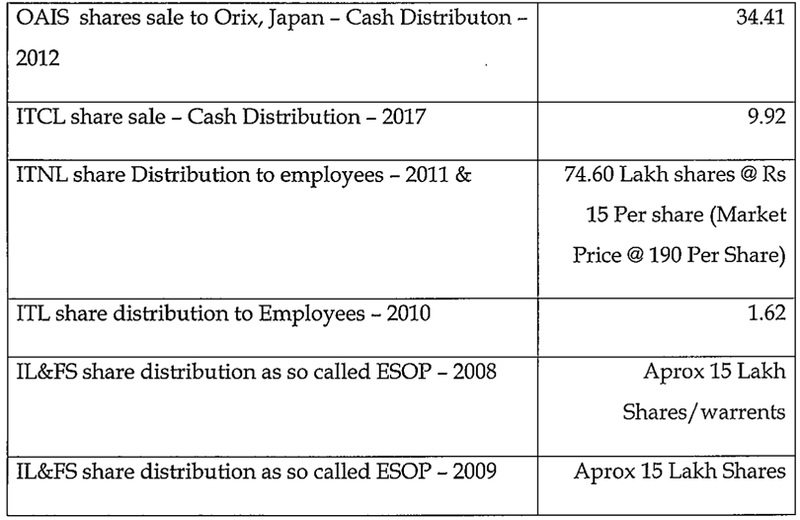 EWT had distributed these shares to employees at Rs84 per share (about 15 lakh shares or warrants) and Rs132 per share (around 15 lakh shares). This deal shows windfall gain and also a violation by EWT for the conditions of warrants. "While distributing the shares, the EWT had violated the conditions of the share warrants issued by IL&FS, with respect of transferability of the warrants, the condition was that the EWT cannot deal in the warrants as long as warrants were not exercised and were converted to equity shares. The trustees were in haste and even before warrants were converted to equity shares, the same were sold to employees," the SFIO report says. 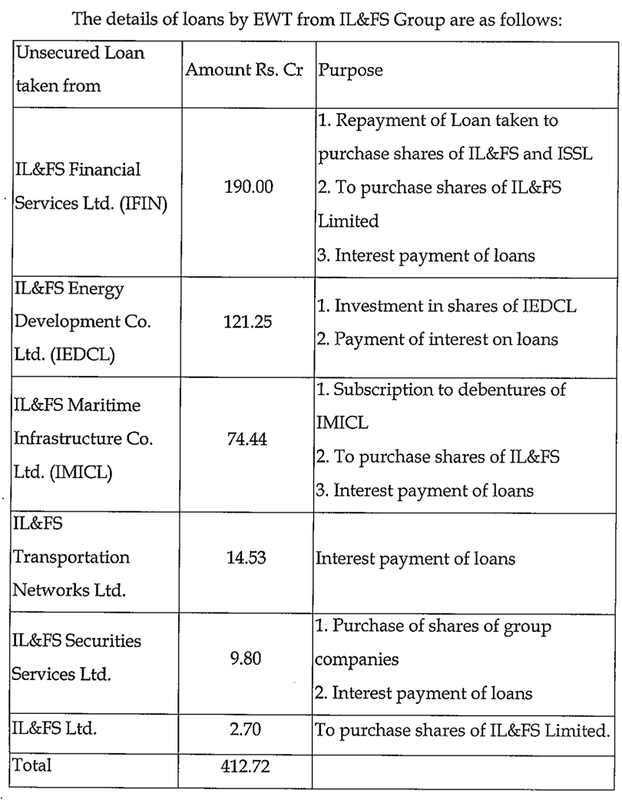 The report also exposes how loans were extended to IL&FS employees' welfare trust -EWT to buy shares of IL&FS or a group company and to pay interest on the loans. SFIO says, "The loans extended to EWT were approved by the CoD of the respective IL&FS group companies. The EWT was dependent on interest and dividend income from the group companies, for servicing its debt. From 2006 onwards, as the sale proceeds of shares were distributed among the select few employees rather than being used for repaying the debts." "The trust was continuously suffering funds crunch on account of debt and was forced towards seeking new debts from the IL&FS group companies for service its existing obligations on regular basis, leading it into a debt-trap. These loans have caused further stress to the lending group companies and their extension reveal lack of due diligence and conflict in decision making," the SFIO concluded in its interim report. It is shocking that an employee welfare trust seems to have been converted into a trading vehicle of sorts to enrich a few top executives. On Monday, 4th December, even as the Serious Frauds Investigation Office (SFIO) was asking for a freeze on the assets of top officials of IL&FS (Infrastructure Leasing & Financial Services), I received copies of a set of letters written by a whistleblower with explosive information. He had written to every person or entity who could have acted in time to reduce the damage caused by the finance group’s fraudulent dealings. But they did nothing. • 2 May 2017: The whistleblower, who signs as Mahesh Inamdar, wrote a three-page letter to the board of directors of IL&FS with specific names of employees, problem accounts and amounts involved (details later). I understand that the board was persuaded not to discuss the letter because this was under a pseudonym. I further learn that one board member asked for the letter to be discussed a whole year later, at the July 2018 board meeting, when Ravi Parthasarathy, founder and former chairman, resigned on health grounds. It specifically names Ravi Parthasarathy, Hari Shankaran, Ramesh Bawa, Arun Saha and K Ramchand. He pleads with the directors to “initiate emergency repair work,” by providing specific amounts, names and deals where money was extended to dubious entities or was written off. Some of the entities/industrialists mentioned in the letter are well-known friends and cronies of the cabal that controlled IL&FS. Again, it points to the massive realty exposure undertaken by the group which has absolutely nothing to do with public infrastructure. Nothing happened. Remember how RBI had claimed that its investigation report had flagged issues with IL&FS two years ago? Well, these letters allege corruption, and worse, with specific details. Will SFIO find out if the RBI governor had even forwarded these letters to the inspection and supervision departments? • 21 July 2017: The whistleblower also wrote to independent directors of IL&FS Financial Services (IFIN). Specifically, the letters went to Surinder S Kohil (former chairman of Punjab National Bank), Subhalakshmi Panse (former chairman of Allahabad Bank) and Uday Ved, taxation head of KPMG LLP. Titled, “Serious corruption/corporate governance issues”, he wrote that the purpose of the letter was to draw their attention to the “extremely serious situation which threaten IFIN survival even over the next 12 months, mainly due to serious corruption at IFIN. RBI role is very critical as real stakeholders are banks (public money) with exposure at serious risk”. Nothing happened. This letter mainly highlighted massive loans, of over Rs4,000 crore, extended to dubious or politically-connected realty companies. 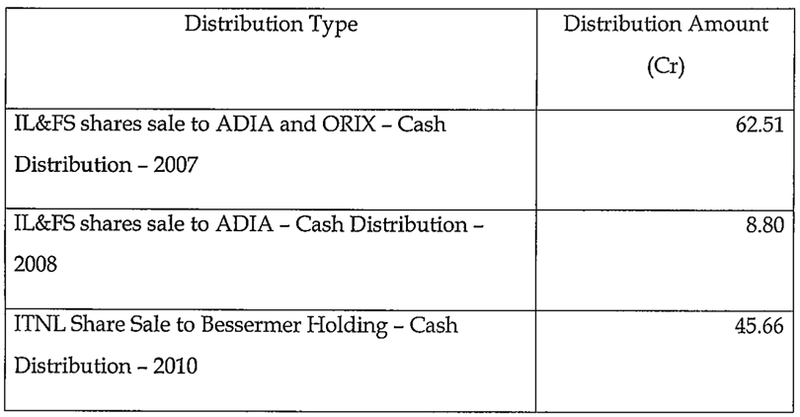 It named specific individuals, companies and amounts. This letter was also copied to the RBI governor and major institutional investors of IL&FS. • 31 July 2017: This time, the whistleblower, calling himself Sanjay Gurukripa, writes to Sunil Mehta, managing director (MD) of Punjab National Bank (PNB) which is already reeling from the Nirav Modi scam. It is marked “Extremely Confidential and Urgent” and is all about Vadraj Cement Ltd (formerly ABG Cement) which figures prominently in all the letters. It highlights “Serious fraud by promoters (abuse of Strategic Debt Restructuring scheme) on the consortium of banks including PNB as lead banker and other public sector banks (PSBs)—Dena Bank, Union Bank, Indian Overseas Bank, Central Bank of India, Bank of India, Oriental Bank of Commerce and Corporation Bank.” This letter deserves a separate column; it was marked to the chief vigilance commissioner, along with branch heads and MDs of the consortium of banks named above. • 12 May 2018: Despite the lack of action and response to this huge effort to get the attention of every authority responsible for regulation and supervision of the financial system, the whistleblower writes one more letter (as Sanjay Gurukripa), with more details, to Urjit Patel, RBI governor. This was before Ravi Parthasarathy stepped down as chairman and is marked “Extremely confidential and urgent”. It not only provides an update of affairs at IL&FS, calling it a serious scam; but has this warning underlined: “At (the) present speed of deterioration, IL&FS would collapse in next 12-18 months.” This letter highlights how credit ratings are manipulated; how the top five members of Mr Parthasarathy’s cabal “who are running their own fiefdoms (absolutely corrupt/massively incompetent)…” had all got their tenures extended, although they were over 65 years old. Interestingly, this letter is copied to the heads of CARE Rating, India Ratings and Research, Deloitte and Orix. These letters have brought out the following facts. 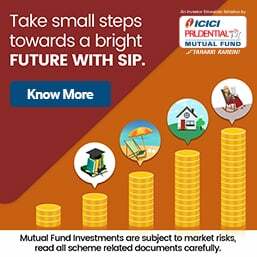 First, a cabal of five people (founder Ravi Parthasarathy and his cronies Hari Shankaran –vice chairman, Ramesh Bawa, K Ramchand and Arun Saha) were running this giant finance and infrastructure conglomerate like a personal fief, along with four or five other persons in their inner circle. It points to how rating agencies had ignored specific bad loans and massive exposure to realty, as well as huge ever-greening of loans to the following: ABG Shipyard/SIMEC (this is serious because these companies were into defence deals), SKIL Infrastructure (Rs1,000 crore each), Sivasankaran group (new exposure, despite previous losses to the group), Unitech, Parsvanath Developers, Era Housing, HDIL Ltd of the Wadhwan group, the politically-connected Kohinoor group, Ind Bharat Energy, Varun Shipping and KVK Infrastructure. Most of these are under bankruptcy proceedings. The whistleblower alleges that manipulation of ratings was the key to ensure ever-greening of loans to these entities and to give them fresh funding. Another scary revelation is that “nobody is aware of the extent of contingent liabilities of IL&FS through comfort letters and DSRA (debt service reserve account) support issued for borrowings by group companies which will soon convert to actual liability." He also alleges that “foreign offices of the group are a big question mark and (are) being used for moving illegal money overseas.” All this and more is beginning to spill out into the public domain. Other letters have details of many specific loans, adjustments and accounts that need to be handled separately after some verification. Some of it is already in the SFIO report, which is also in the public domain. 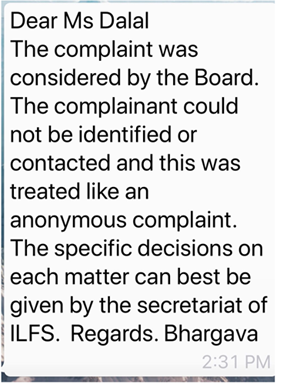 I have asked three former independent directors of IL&FS, the holding company, for their response. They were RC Bhargava, Jairthirth Rao and Reena Kamat. Only Mr Bhargava responded, I have reproduced his response at the end of this column. Earlier, on 2 October 2015, Umesh Baveja, the founder of RAHI Aviation, who has victimised by IL&FS had written a detailed letter to the Dr Raghuram Rajan exposing the group’s incestuous dealings to collect multiple fees and charges (all of which are now part of the SFIO report). He too did not bother to act on the letter, although Mr Baveja was his former batchmate. So RBI’s failure to act predates Dr Urjit Patel’s tenure. This shocking saga shows that not one of the checks and balances, instituted in the form of endless red tape and check-box disclosures meant for directors, actually works in real life. These routine compliances are only a way to help regulators cover their own tracks and evade responsibility. The letters expose the regulator, bankers, investors and rating agencies as being complicit in the scam by refusing to heed warnings and take cognisance of very specific facts and details provided by the whistleblower. Unless SFIO’s investigation also questions, as Sherlock Holmes would say, ‘the dog that didn’t bark’, we, as a country, will only lurch from one financial scandal to another, with the losses being paid by the people, through the exchequer. 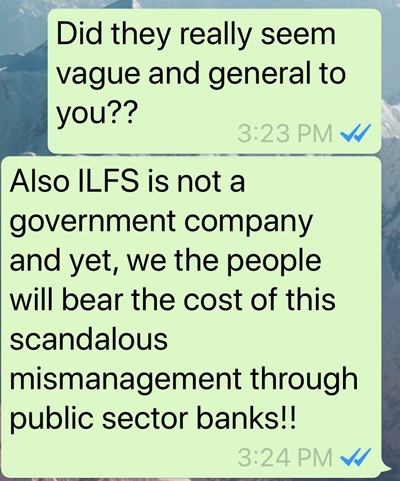 The standing committee of parliament, which comprises our elected representatives, is apparently looking into the IL&FS scandal. So far, parliamentarians have shown no inclination to go beyond the bureaucratic process of seeking in-camera depositions of those who are either directly responsible for the scandal or have failed to act. This has never yielded any result in the past few decades. The series of financial scandals under the United Progressive Alliance, and the recent ones under the National Democratic Alliance, not to mention the embarrassing dirt spewing out of the Central Bureau of Investigation, shows that we, as a people, need to demand better accountability and a better way of dealing with financial scams and corruption. The buck must stop at the regulators who fail to act and the investigations must begin by questioning them, rather than allowing them to turn investigators! 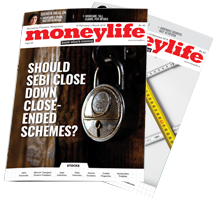 Moneylife requested Mr Bhargava and other independent directors for feedback on whether the board ever took cognisance of the whistleblower’s letter and why no action was ever initiated. The conversation below tells its own story. The buck must stop at the table of the much feted RBI governers Mr. Rajan and Mr Urjit Patel. Mr Rajan has recently been vocal about "independence" of RBI. Is looking the other way when serious allegations are made against an institution under their watch, also "independence"? It is the practice of all the authorities you are referring whistle blower ignored for one year. But they have ignored the similar report from me for the past 15 years about nationalised banks. If they have initiated action today's banking crisis Bank of Baroda Forex scam of 6000 crore and PNB scam of 13000 crore could have been avoided. But greater scam of third party gold import scam has not yet been probed by all these authorities even after repeated reminders. by the regulatory agencies created for specific tasks and these agencies must act independently and in cooperation with each other. Rating agencies and company auditors too should not enjoy exemption from accountability for their reports. Finally a Super Regulator with sufficient deterrent power and answerable only to Supreme Court should be appointed. With this be acceptable to power-hungry and corrupt rulers and their yes men (with due respect to the upright among them) ? No one has the courage to stand-up. Chairpersons rule the board committees and nothing happens... There is no law and order to try criminal or other offences. No frontline business channel will carry this. All chase Mallayas and Modis because of the glamour attached to them... IL&FS is a boring story not juicy enough..why does Mr Modi not speak about this in public? Ever thought why these top executives of past & present, occupied such exalted, systematically important and strategic positions? Only because they had past credentials of being part of such acts and had history of glossing over such information. 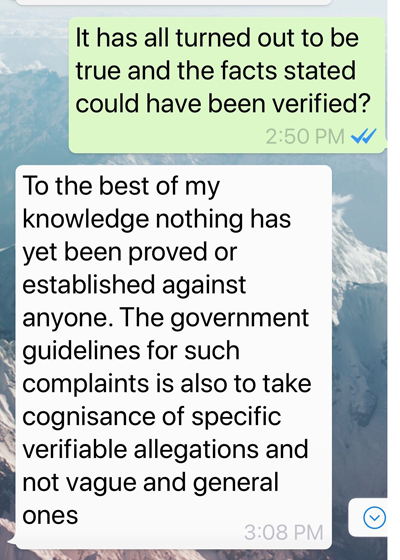 The exchange with R C Bhargava that you have shared is the most revealing at this juncture & is endemic to system at large. "R C Bhargava, independent director & of #MarutiSuzuki fame responds that the letter was anonymous and therefore IGNORED. When VERY SPECIFIC INFORMATION (firms, Bank accounts, Amounts, transgressions) is provided (Like a BODY of a MURDERED VICTIM) does one start looking for the MURDERER or to DISPARAGE the tip off because it came from an unknown person." What explains this INACTION in THE face of DESPERATE CRYING NEED? -DISMISSED as HALLUCINATIONS of a RAVING MAD (despite EVIDENCE?). -Don't DISTURB the APPLECART, when on the SURFACE everything is so CALM & ROSY. -No one wants to be HARBINGER of BAD NEWS. -CRIMINAL NEGLIGENCE as mentioned earlier. You think banks are in any way better managed than IL&FS? India has become den of corruption that too mainly government institution.The corrupt act takes place below the attention of regulators due to failure of their duties.Finally this corrupt deals are bailed out at taxpayers cost.None of institution have remained clean.Keeping silence is horrible way of corruption.